On-Prem, MDM or Cloud License expires. Computer moves to unlicensed / never licensed location. Using PolicyPak cloud, you specifically unlicense a component. Using PolicyPak cloud, you specifically revoke the CSE. Deleting / unlinking a GPO. Removing an XML file placed with SCCM or by hand. Removing an XML directive from PolicyPak Cloud. What happens when the component is UNLICENSED is that the endpoint simply doesn’t pick up new directives for that component. However you might be interested to understand the unlicensed / revert behavior for each component. Each component is listed here. (Current as of Jan 2018). Will not honor new PolicyPak Application Manager requests. A setting may be set to DO NOTHING AT REVERT (Default), and example shown here. If the setting is set to REVERT.. it will do that (Example here.) The value displayed will be performed at REVERT time. For Win32 apps where AppLock (UI restrictions) are used, like in this example.. the UI becomes unrestricted. When NTFS / ACL Lockdown is used (see here), the end-user will be free to change these settings inside the (previously restricted) registry. Note also that some Paks may be set to "System Wide Lockdown" like Java and Firefox like what is seen here. In those cases, all users on the system are free to make changes after the GPO no longer applies. PPLPM will stop honoring new policies when unlicensed. Applications / MSIs / Scripts etc with elevated tokens will not elevate. SecureRun(TM) will stop preventing users from self-installing items. The original default browser (as the user had it set before PolicyPak Browser Router was installed) will be placed back as default. 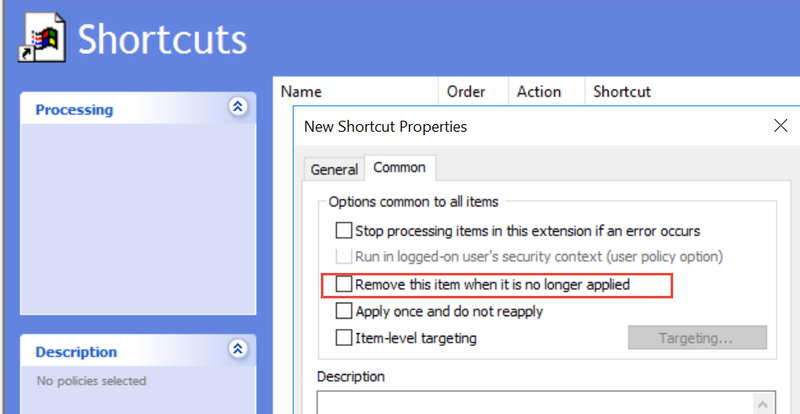 Additionally, and/or when the GPO / XML no longer applies, policy setting items work and revert exactly like Microsoft's Admin Templates Policy settings. So when PolicyPak Admin Templates Manager policy settings no longer apply, they revert back to their "Not Configured" value. In-box Group Policy Preferences is called directly; no more PolicyPak involvement. PolicyPak will not process PolicyPak Cloud XML directives. PolicyPak will leave the Microsoft GPPrefs item intact / alone on revert when the item's "Common :: Options" tab is set like this. 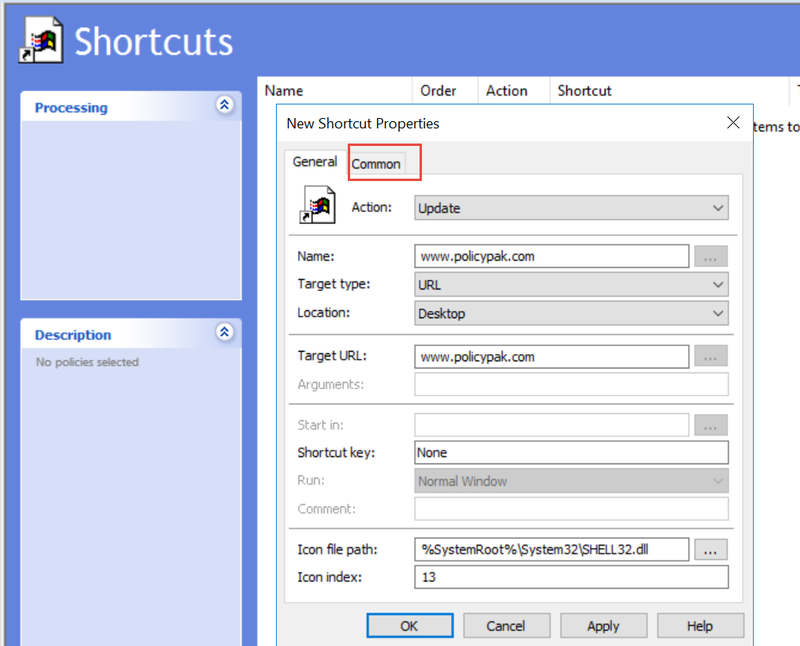 Or PolicyPak will delete the Microsoft GPPRefs item when the item's "Option" tab is set like this. When PolicyPak Java Rules Manager becomes unlicensed, PPJRM will not honor new PPJRM policies. Additionally, and/or when the GPO / XML no longer applies PolicyPak will stop existing mappings of websites to Java. The system will maintain the last settings placed by PolicyPak File Associations Manager. The system will permit users to make their own changes going forward. Other users on the system may make changes such that they will affect other users. PolicyPak Start Screen & Taskbar Manager will not honor new directives. The system will permit users to make their own Start Menu and taskbar changes. New users with new profiles on the system will get system default Start Menu groups. PPSEC will no longer process XML based directives. PPSEC items work exactly like Microsoft's Security Settings Policy settings when the GPO is removed, or the policy is no longer applied or PPSEC becomes unlicensed. Like built-in Microsoft Security policy settings, when these settings no longer apply, they are maintained; and not reverted back. Local admins can then make changes to these settings if desired. The last set of Features and Optional Features on the machine will be maintained and will not revert. PPFMW will no longer process XML based directives.